Well, Christmas is right around the corner and that can only mean one thing. The church Christmas plays are about to start! 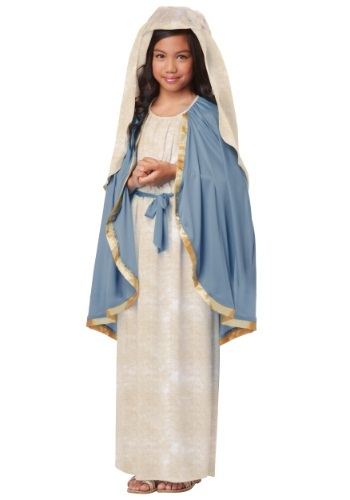 If your little girl scored one of the leading roles in your church’s play, she may very well need this Virgin Mary Costume for girls. She will surely shine in the spotlight like something most holy with these glorious garbs on. Everyone loves a good Christmas story! Stories about Rudolf the red nose reindeer and frosty the snowman always make children smile. However, one story that is always told around Christmas and does even more than bring a smile to one’s face, is the beautiful story of Jesus’ birth in the Bible. It is truly one of the most heart-warming stories out there. So if your little girl has the opportunity to portray one of the most iconic women in the history of the world, you have to make sure she is dressed for the part. With this lovely tan dress and attached blue cape, topped off with an elegant tan headpiece, your little girl will make it appear as if a Mary from a nativity scene decoration has come to life! Everyone in your congregation will absolutely adore your little girl as she is sitting center stage with Joseph and the babe in a manger. Make sure to remind your kiddo to smile big because everyone will want to take pictures of this endearing Bible story as it plays before their eyes!